David ran a basic supply drive at ESU last year. East Stroudsburg University alumnus, David Good left Monday, November 4, 2013 to begin his journey to see his mother. This is the second time Good has made the venture into the jungles of Venezuela to be reunited with his Yanomami family. The Yanomami are an indigenous tribe residing within the Amazon basin in southern Venezuela. Good’s father, Ken Good, an anthropologist, had stayed for twelve years among the Yanomami tribe in the jungles of Venezuela where he met and fell in love with Good’s mother, Yarima, a native Yanomami woman. Upon returning back to America, the couple began a family. A few years later, while the family was on a trip to Venezuela visiting their home village known as Irokai-teri, Good’s mother made the decision to leave her family and stay with the Yanomami. “For the first five years of my life I grew up in two worlds speaking English and Yanomami with my mother. Though we were a happy family, my mother could not withstand the lonely nights apart from her Amazonian family,” said Good. 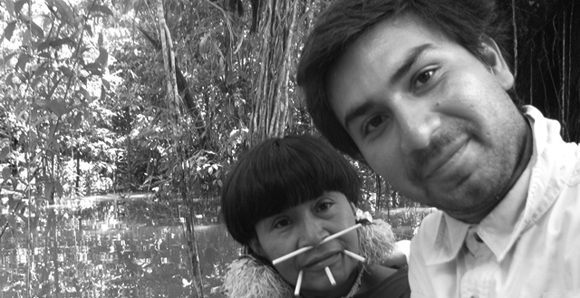 In 2011, after nineteen years of separation, Good made the trip to reunite with his mother and the rest of his Yanomami family. “Though we are of different tongues and different worlds, the cultural barrier did not dissolve the bond we had for each other. Though she left me when I was just a young boy, I completely understand why she had to do it. I am at peace with this now,” stated Good. Come 2013, two years later, Good has just left to partake on the same journey to be reunited with his family. In 2011, Good’s main focus was to meet and reunite with his mother. However, come 2013 he stated that during his second trip he would focus on learning more about everyday Yanomami life and culture. Since his last trip, Good has taught himself Spanish and spent a large time giving talks to groups, college classes, etc. about his Yanomami family and his journey. With a great deal of love for his Yanomami background and his people, Good has established “The Good Project.” This project currently functions to bring awareness and simple medical necessities to those that need them. In the future, “The Good Project” hopes to contribute to change that significantly helps preserve the Yanomami. “The Good Project,” is currently undergoing the process to becoming a recognized non-profit organization. A major television network has also joined up with Good. The television network will be filming Good’s return and reunion with his mother, and the film is expected to air nationally around Mother’s Day, 2014. Before making his return back to his Yanomami family, Good fundraised and helped donation drives. Good spent time collecting things to bring back to his family, friends, and mother in his village of Irokai-teri. Those things are often times as simple as clothes, Advil, or peanut butter. Good said that the Yanomami live a very simple life. “They wake up, look for food, and spend their time crabbing, or doing their own forms of crafting,” said Good. Good stated that he enjoyed the simplicity of the Yanomami life. While visiting he did not have to worry about work or meetings. While Good is in the jungle, he is not completely off the radar. Here at ESU, Good has established what he calls a “mission control team,” to keep his followers and supporters up to date on his adventures. If you are interested in learning more about David Good and The Good Project, a Facebook page, Twitter account, and Instagram profile are all being updated even while Good is away. The Good Project Mission Control team is also offering followers the opportunity to “Ask David.” Good has been given a satellite phone, giving him the opportunity to make calls back to America. Once a week, Good plans to call back to his team, giving them updates. This also gives people the opportunity to “Ask David” any questions they have about his travels, his mother, or Yanomami in general. The questions will be answered, recorded, and posted onto The Good Project Facebook page, www.facebook.com/pages/The-Good-Project. Good expressed that he is eager and excited to see his mother and Yanomami family again. He also stated that he is looking forward to being able to return to America and share pictures, videos, and stories.